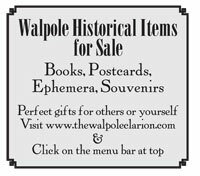 Since October 2011, THE WALPOLE CLARION has been published as a service to the Walpole, New Hampshire community, which includes: Walpole, North Walpole, Drewsville, and Bellows Falls, Vermont. The CLARIONS’s mission is to provide a monthly vehicle to share items from the recent past or future. 2] Walpole Organizations and Residents: e.g. schools, churches, library, Hooper Institute, sports, WRAP, et. al.